A small piece of American history and the perfect gift for a birthday! 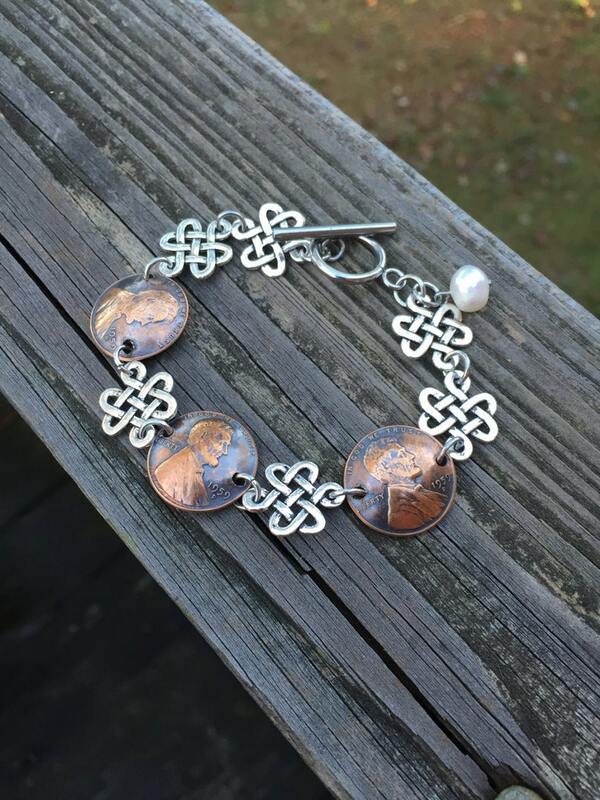 This is a lovely bracelet made with 3 1959 pennies, silver tone Celtic knot connectors and a stainless steel toggle that features a single freshwater pearl dangle. Made to be worn with the front of the penny showing so the date is visible. Measures 7 1/2 ". If you need a smaller or larger size just message me first. These pennies have not been cooped up in a paper tube for years, they have been out in circulation mixing and mingling, jangling and jingling and traveling the country. From pockets to purses to piggy banks to cash registers, they've seen it all! If only Pennies could talk, oh the tales they would tell about the places they've been, the things they've bought and the pockets they've been in! Just think of all the American history these pennies have circulated through! Even though they are the least of the American coins their strength and endurance have seen them through, just like the American spirit this country used to have. That makes them the perfect gift for someone celebrating this milestone birthday. These years of experience have given them their smooth, warm, rich patina that contrasts so beautifully with the silvery Celtic knot connectors and the freshwater pearl dangle. A lovely gift and a small piece of American history all in one. Enjoy! I bought this for my mom’s birthday and she is going to love it! It’s even prettier in person than in the photos! It’s is such a unique gift and I couldn’t believe the customer service that came along with it. The bracelet came displayed in a gift box, and the package included extra links for sizing, a polishing cloth for care, and a little holiday gift from the seller! I would definitely recommend this gift and shop to anyone!